ANCIENT HISTORY -- In the 1980's, working with legendary dive instructors Ken Cruse and Kenny Young, I was fortunate to conduct at least a score of dive groups to Grand Cayman. Our formula for a seven-night stay offered guests three days of boat diving, three days of beach diving, and a guarantee of at least four dives per day for those who could keep up. Between working our butts off hauling beach tanks, Cruse and I would log 30+ Grand Cayman dives in a week, all while doing our best to show guests, avid scuba divers all, some truly great diving. 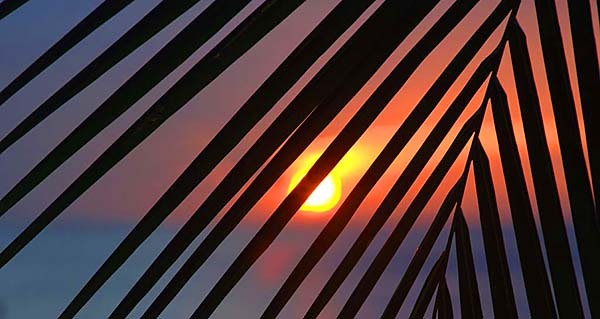 MODERN TIMES -- It was with these old memories stirring that I recently returned to Grand Cayman after an extended absence. In the past decades, most of my diving has been in Asia; heavy jet lag destinations like Indonesia, Papua New Guinea, and the Maldives. Thus it was pleasantly refreshing to travel from Houston to Grand Cayman in a flight of little more than two hours. The ride from the airport certainly was an eye opener. I used to drive this entire island in a rusty rental van full of tanks, from West End to the far reaches of the North Wall (yes, we dived North Wall off the beach), all on the "wrong" side of the ride. But so much has changed in the intervening years that on this visit I could not have found my way from the airport to town without a guide. AN ABLE GUIDE -- Fortunately, my wife Karen and I were met at the airport by Arie Barendrecht, owner of Cobalt Coast Resort. Driving his vintage Land Rover, Arie kept up a steady reportage as he gave us a tour of 21st Century Grand Cayman. Most of my old haunts were still in place, but there has been so much new construction I could barely place them. Ari pointed out some remaining signs of July 2004's Hurricane Ivan; stretches of uprooted casuarinas trees along back streets, and a few private homes that have yet to be renovated. Fortunately, most of Grand Cayman's hotels have been completely rebuilt and are back in service better than ever. A variety of new properties, both hotels and condominiums are under construction all over the island. A very welcome renovation is the new Tibbetts Highway that runs behind the hotel strip along 7-Mile Beach. This modern four-lane artery has improved the traffic flow and opened up an entirely new realm for the hard-working developers to consider. WEST BAY UNCHANGED -- Once we turned off onto Northwest Point Road, I was able to relax, as the scenery became familiar again. This area still resembles the "old Grand Cayman" that I had loved. Small, well-tended private homes, and a few attractive condominium projects, are interspersed with undeveloped stretches of sea grape beside the azure blue Caribbean. It was interesting to learn that the West Bay area, where the Caymanians have lived for centuries, weathered the major storm with much less damage then that experienced along 7-Mile Beach. TURTLE FARM GOES UP MARKET -- Farther up West Bay Road, the Turtle Farm has expanded across the two-lane street into a Cayman Islands-style theme park now called Boatswain's Beach. It features more and larger turtle breeding tanks, a controlled nesting beach, a nature trail, aviary, glass-walled marine predator tank, two swimming lagoons (one fresh water, one salt), a restaurant and gift shop, and a wealth of new activities for adults, as well a major focus on kids activities and education. In the place where we once led impromptu beach dives to the mini-wall in front of the Turtle Farm, now stands a perfectly sited location of the Divetech dive shop. It's nice to know that this excellent beach dive can now be accomplished with greater ease and dive shop support. COBALT COAST RESORT -- Our expertly guided tour ended at Cobalt Coast Resort, Arie Barendrecht's own impressive contribution to the development of the Cayman Islands. Arie, and his excellent manager Dora Valdez, are the reasons why this tidy 18-room boutique resort is a dedicated diver's dream come true. Cobalt Coast is the product of a lifetime career spent in the hospitality business. Cutting his teeth at age 16, as a porter on a small cruise ship sailing from his native Holland to New York, Arie Berendrecht went on to attend Amsterdam's best hospitality school. He refined his expertise over decades working across Europe and the USA, eventually becoming General Manager of one of Nevada's largest and best-known casino hotels. The result is a man who appreciates the subtleties of the business of hotels, food, and beverage, and is a master of the fine art of hospitality. Discriminating Cayman-bound scuba divers are the ultimate beneficiaries of the fact that Arie chose this beautiful stretch of shoreline in quiet West Bay to create his own little piece of paradise. 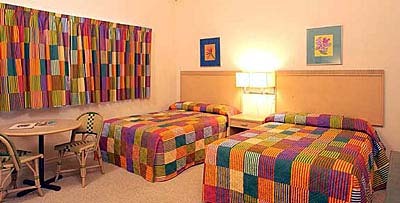 Cobalt Coast Resort offers comfortable, centrally air-conditioned, suite-style rooms, with living room, bedroom, and a large bathroom including shower, a deep soaking tub, and plenty of hot water. The living room includes a refrigerator and wet bar, a ten-cup coffee maker with real cream provided, a small dining table, and cable TV. For larger parties, a few two-bedroom units are available. There is a restaurant offering both al fresco and indoor dining, with a creative and varied menu. Beyond the bar are a small swimming pool and a hot tub, both overlooking the ocean. The little poolside bar is friendly and the drinks are reasonably priced, with the added benefit of free wireless Internet around the bar and pool area. From a diver's perspective, this idyllic picture is completed with Divetech's main location integrated into the hotel's design. Just to one side of Cobalt Coast's pool you will find spacious gear racks, lockers, dip tanks, and a very complete dive shop ready to serve everyone from casual snorkelers and new divers to technical divers requiring tri-mix and/or rebreather support. DIVETECH -- Owned by Jay and Nancy Easterbrook, Divetech Grand Cayman has been serving divers for 14 years. They met when Jay was taking a divemaster class, and spied Nancy exiting a shore dive wearing a set of double tanks. What else could a man wish for in a woman? Love came along with advanced diving instruction, and Jay and Nancy were married in the Cayman Islands. Divetech began with a shore diving location and complete training facility located at Turtle Reef, next to the Turtle Farm. Early on, Divetech was a stand out for being an early adopter of Nitrox, as well as offering apnea, free diving, and technical diving instruction and support in addition to more traditional sport diving services. 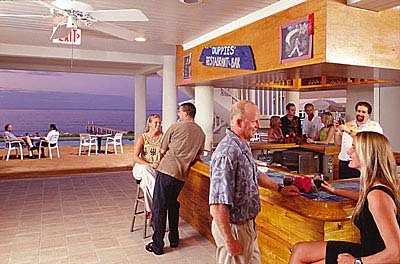 Divetech's second location, at Cobalt Coast Resort, opened in 2000, completely coordinated with the design, construction and opening of the resort itself. This has proved to be a very powerful and mutually beneficial collaboration. SUPERIOR DIVE SERVICES -- Divetech now operates two custom dive boats, Atatude, a 38-foot Newton; and Tenata, a 34-foot Delta. Both are set up explicitly for scuba diving, with great tank racks, a proper ladder, large camera table, plenty of fresh water, and enough shade for those with sense enough to get out of the noontime tropical sun. Towels and chilled fruit are offered between dives. Because of Cobalt Coast's northern location, average boat rides are only 15 to 30 minutes. Whenever weather permits, dive site selections are on the North Wall, which offers the island's legendary sheer wall diving. Maximum diving depth is 130 feet, and maximum duration for each dive is one hour for those with the air consumption to enjoy it. By Grand Cayman's standards, these are attractive options. Computer profiles and Nitrox use are encouraged. Those who do not own a dive computer of their own receive a loaner air/Nitrox computer at no additional charge. TECHNICAL DIVING -- Cayman is unique in its easy access to deep wall diving, with the added benefits of warm water and generally placid conditions. As a result, Divetech has been at the forefront of teaching safe technical diving, opening properly trained divers to depths well below basic sport diver ranges. All of Divetech's dive guides and shop employees are certified dive instructors, each with a minimum of five years teaching experience. There are currently 16 instructors on staff, hailing from the USA, Canada, and the U.K. Both TDI and IANTD courses are offered, from Advanced Nitrox through Advance Trimix, for both open circuit and closed circuit rebreather diving. In addition to these high-level training options, Divetech offers "learn to dive" classes, certification referrals for TDI, SDI, PADI, SSI, NAUI, BSAC, and YMCA, and of course full scuba certification courses. With Divetech's help, Cobalt Coast Resort has been named a PADI Gold Palm Resort, an SSI Resort, and a NAUI acknowledged dive facility. In a nod to their high levels of service and professionalism, the InnerSpace Tech Diving Conference has used Cobalt Coast Resort and Divetech as its host for the past four years. High on the list of unique and popular programs offered by Divetech are the underwater scooter rentals for the "West Bay Express." Employing the latest Apollo scooters, this enables divers to enjoy a high-energy 1.2 mile, one-way dive excursion along the richest portion of Cayman's West Wall. Another feature is the "rebreather experience" which introduces interested divers to closed-circuit diving without the substantial cost of owning one of these units. For qualified divers, rebreather rentals are available with Silent Diving Systems Evolution and Inspiration units, Jetsam Technologies' Sport and Classic KISS systems, and the Diverite Optima. More advanced systems continue to be offered as the technology progresses. To support all of this advanced diving, Divetech's compressor blending system is state of the art, offering everything from 5-times filtered air to all ranges of Nitrox and Trimix blends pumped on site. No other dive shop in the Cayman Islands comes close to Divetech's level of service offerings and technical expertise. KIDS'S PROGRAMS TOO -- But it's important to note that it's certainly not just all advanced scuba and technical diving here either. Much of Divetech's business involves serving snorkelers, new divers in training, and regular openwater scuba divers. There are also children's scuba programs beginning with kids as young as eight years old. Three weeks in the summer are dedicated kids' weeks with Scuba Rangers, PADI Seals, and Junior Open Water and teen scuba activities. 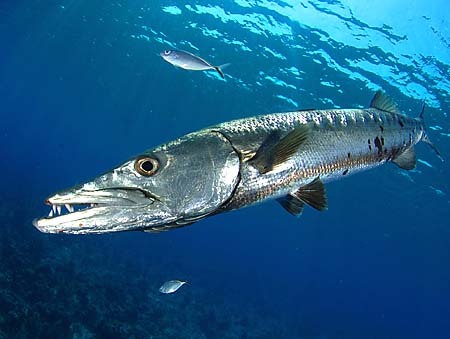 Are you ready to dive with best in Grand Cayman? Contact Island Dreams for details. GETTING TO THE CAYMAN ISLANDS -- Located in the center of the Caribbean, south of Cuba, the Cayman Islands have their own flag carrier, Cayman Airways, with flights originating from Miami, Tampa, Houston, JFK, and Chicago. American Airlines flies non-stop from Miami. Continental operates non-stop service from Houston. Delta flies non-stop from Atlanta, and U.S. Air non-stop from Charlotte. All of these U.S. carriers offer attractive connecting flight options from around the USA. INTER-ISLAND TRAVEL -- Unless you are traveling around on the Cayman Aggressor IV live-aboard, inter-island travel is handled by Cayman Airways. Cayman Brac enjoys jet service from Miami and Grand Cayman. Travel to Little Cayman is served by smaller but very dependable Twin Otter turbo-prop planes. CONDOMINIUM OPTION -- As an alternative to hotel-style accommodations, Grand Cayman is a particularly good place to consider the option of condominium lodging. This works especially well for families, groups, or just a few friendly couples who can add value and fun to their dive trip by sharing a two or three bedroom condo and a rental van. The benefits include a spacious living room and a fully equipped kitchen. Don't feel you have to do all your own cooking. Dine out whenever you like, but still enjoy the option of breakfast the way you like, relaxing home-made lunches, and the simple pleasures of a fridge stocked with your beverages of choice, ice cream, and your own special treats. 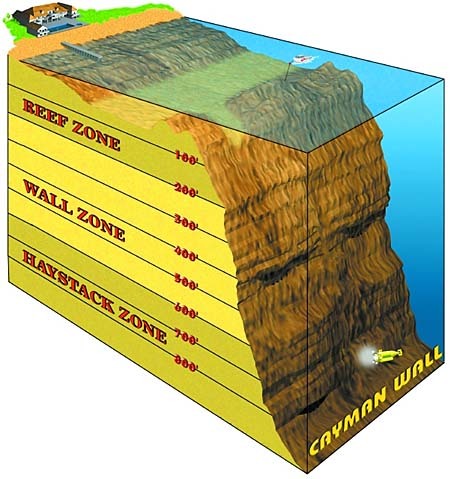 If this is an option you'd care to pursue, Island Dreams has in depth knowledge of Cayman's condominium choices. LIVE-ABOARD DIVING -- For those who prefer a live-aboard, the Cayman Aggressor IV has long been the most popular vessel in Aggressor's entire fleet. Due to this ongoing popularity, availability is limited, so contact Island Dreams now for schedules and pricing. VISITING GEORGETOWN -- Live to shop? You will be in good company in Grand Cayman's main shopping district. This part of the island springs to life when the cruise ships hit town, disembarking thousands of people in search of a souvenir. Georgetown is ready for them, with everything from Harley Davidson t-shirts to Lalique Crystal chandeliers. Beyond Tortuga rum and rum cake, actual local handicrafts are in short supply. Prefer to avoid all the shoppers and cruise shippers? 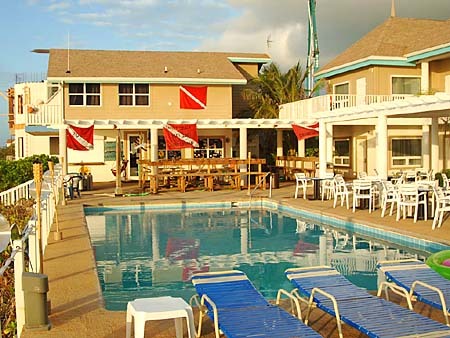 Stay at Cobalt Coast Resort and go diving! 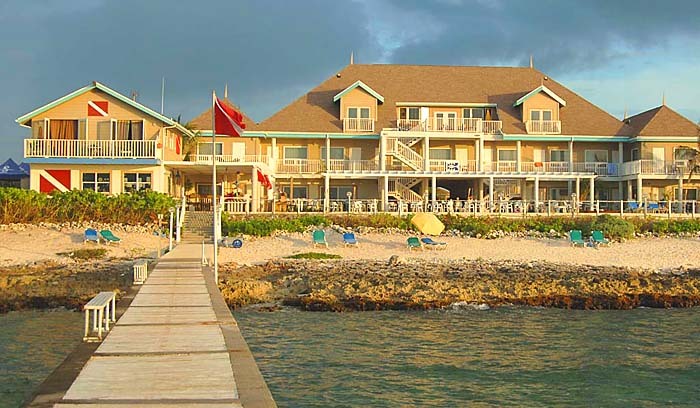 THE BOTTOM LINE -- On Grand Cayman, Cobalt Coast Resort and Divetech are a great choice for quality, value-priced lodging, expert dive services, and an attractive oceanside setting removed from the touristy throngs. If you are looking for a dive trip where the scuba diving and leisurely island atmosphere take precedence over shopping and night clubbing, you will not go wrong with Cobalt Coast Resort and Divetech. PRICING and RESERVATIONS -- Island Dreams has dedicated color brochures and/or videos available for all of the live-aboards, hotels, and resorts mentioned in this report. You are invited to call or e-mail for additional information, advice, or assistance with bookings and airfares to the Cayman Islands, and other choice destinations around the Caribbean and the Pacific.